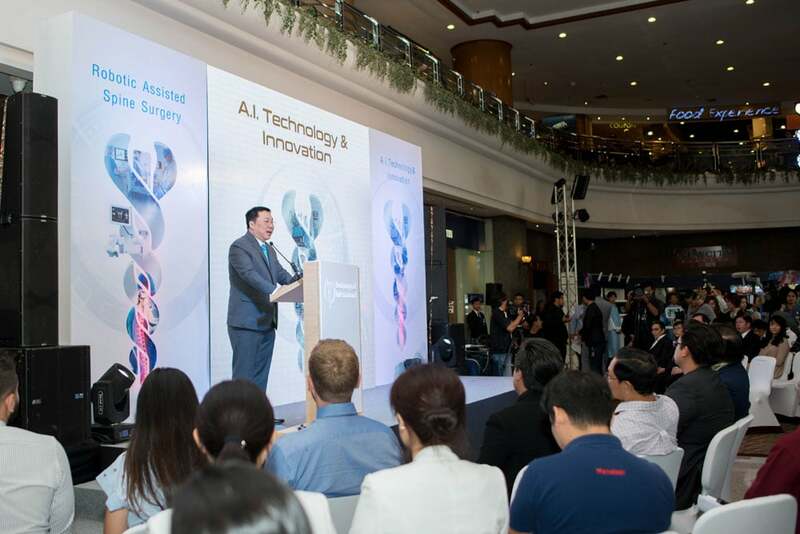 Thursday 7th June saw Spine Connection’s Director of Patient Services, Mr. Jake Lemon, present for the unveiling of Bumrungrad Hospital’s new Mazor-X Robotic Spine Surgery Platform. The Press Conference took place in the Hospital’s main building lobby, with a broad mix of media (Newspapers, TV and Radio), Doctors and members of Bumrungrad’s overseas Referral Offices (RO’s) in attendance. As the No.1 hospital in the world for medical travelers, with over 520,000 overseas patients from almost 200 countries, the event provided excellent opportunity to announce the hospital’s new awards for 2018. Assoc. 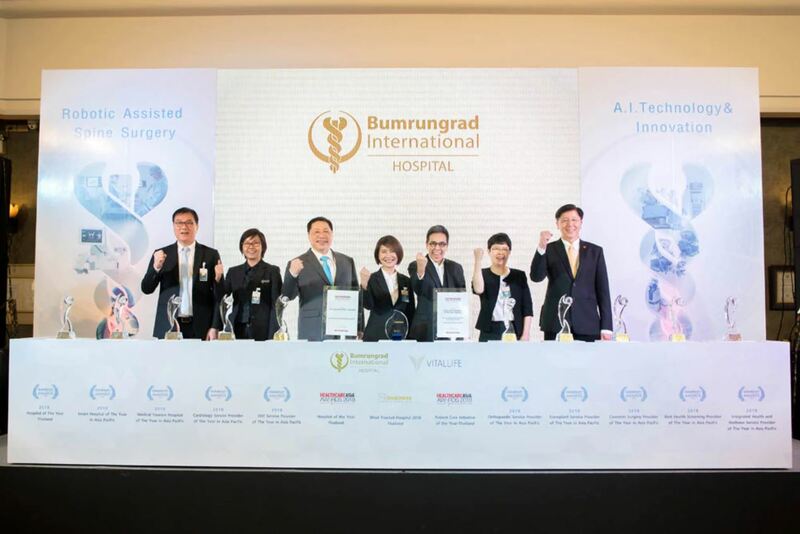 Prof. Dr. Somsak Chaovisitsaree, Bumrungrad International Hospital CEO and Medical Director, said that during the past month, Bumrungrad International Hospital and their Vitallife Wellness Center received over 13 awards presented by several trustworthy Asia-Pacific organizations. For the past 37 years, Bumrungrad has been determined to improve the quality of healthcare services by welcoming innovations, creative ideas, and utilizing effective and efficient procedures that will enhance patient outcomes while keeping up with the latest advances in technology. These latest innovations are artificial intelligence (AI) and robotic-assisted surgery. “A clear example is the “Pharmacy Robot.” Bumrungrad has been using this state-of-the-art, fully-automated drug management system since 2008. The technology offers high precision and efficiency while also reducing medication errors. Patients receive the right medications in the right doses at the right times as prescribed by their physicians. The system thus allows our pharmacists to spend individualized time with the patient educational process,” said Dr. Somsak. 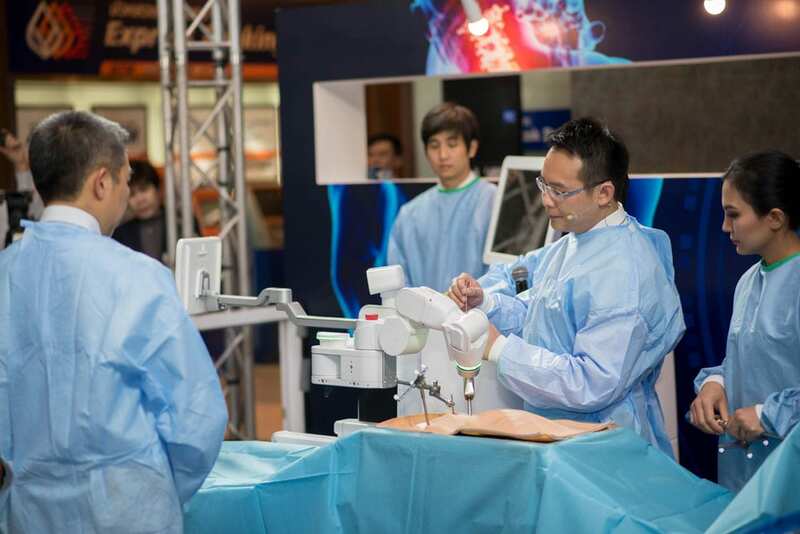 Then in 2016, to increase efficiency and produce superior results, Bumrungrad brought in the da Vinci System (da Vinci Robot) for robot-assisted prostate cancer surgery that is also used for gynecological procedures such as advanced laparoscopic hysterectomies. This advanced 3D computerized technology enables surgeons to operate with high precision with better visualization of internal organs. The latest spinal surgery technology, introduced in 2018 at Bumrungrad, is the state-of-the-art Mazor-X. The Mazor-X is a robot that uses analytical tools, image guidance, and a sophisticated software algorithm to assist the robotic surgical arm during spinal surgeries. 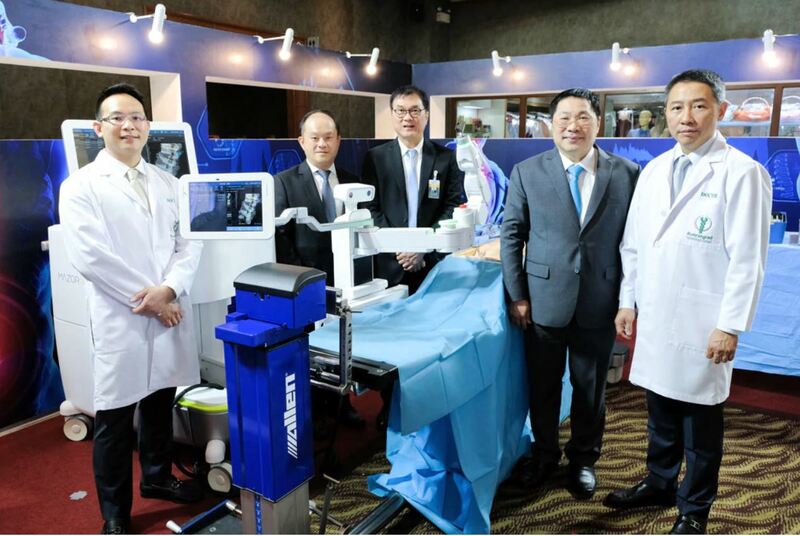 As part of the press conference, the Robotic Spine Surgery Platform was demonstrated in an Operating Theatre Environment by surgeons from Bumrungrad’s Spine Institute, with Dr. Verapan (Spine Institute Director) explaining the benefits. The robotic guidance system uses an integrated 3D camera with spatial tracking and a surgeon control panel. The Mazor-X incorporates a three-step process including (1) Preoperative analytics, (2) Intraoperative guidance, and (3) Intraoperative verification step that enables spine surgeons to operate and be confident that their implants are correctly placed. These three steps result in enhanced surgical visualization, precision, and control. The preoperative analytics of the Mazor-X provide cutting edge anatomy recognition for implant placement planning. During the 3D CT guided phase, the spinal anatomy can be visualized in 3 planes; front-to-back, side-to-side, and top-to-bottom. These 3-dimensional views allow the surgeon precise visualization, control, and the ability to modify the plan based on a proprietary software algorithm. Before implant placement, a patient-specific 3D alignment plan is performed to simulate the impact on the entire spine, and then the guidance arm determines precise tool placement. The control monitor displays and records each vertebra via the CT-fluoroscopy interface known as the 3D image registration process. This spatial tracking keeps tools and implants safely inserted into the correct area. Before final placement, each implant undergoes a verification process, the third step which ensures accurate, precise, and safe placement. 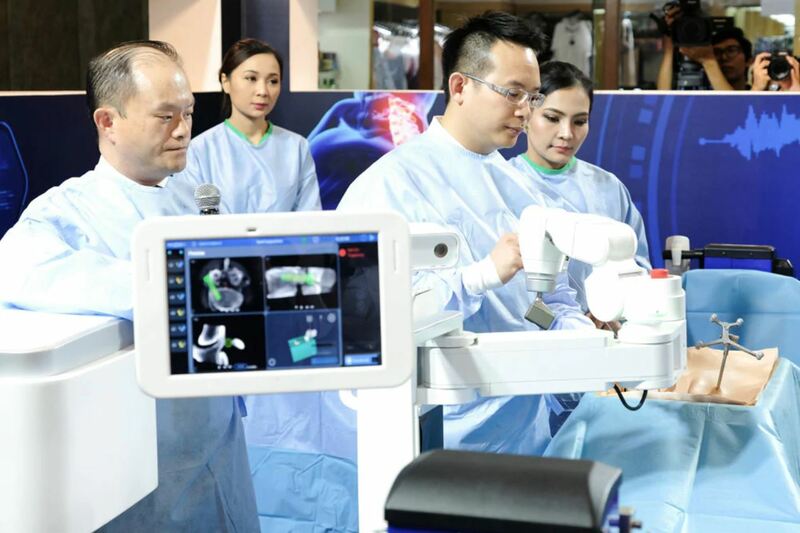 Robotic-assisted surgeries are one of many tools available to surgeons and patients at Bumrungrad Hospital. Depending on the diagnosis and severity of the back pain, treatments can be tailored individually. As part of the peri-operative planning for each case, discussions with the patient about the technology can reduce anxiety and fear associated with the unknown. Now, robots and their AI software aid surgeons during complicated spinal surgeries which lowers the risks to patients especially those who may be over their ideal body weight. The superior visualization offered by AI robots helps the patient during the procedure by reducing trauma, infections, anesthesia time, bleeding, and scarring. All of these benefits allow faster recoveries, superior outcomes, and stronger, healthier patients. For Spine Connection’s Thailand Hospitals, the Bumrungrad Spine Institute, with Dr. Verapan Kuansongtham, Dr. Withawin Kesornsak and Assoc. 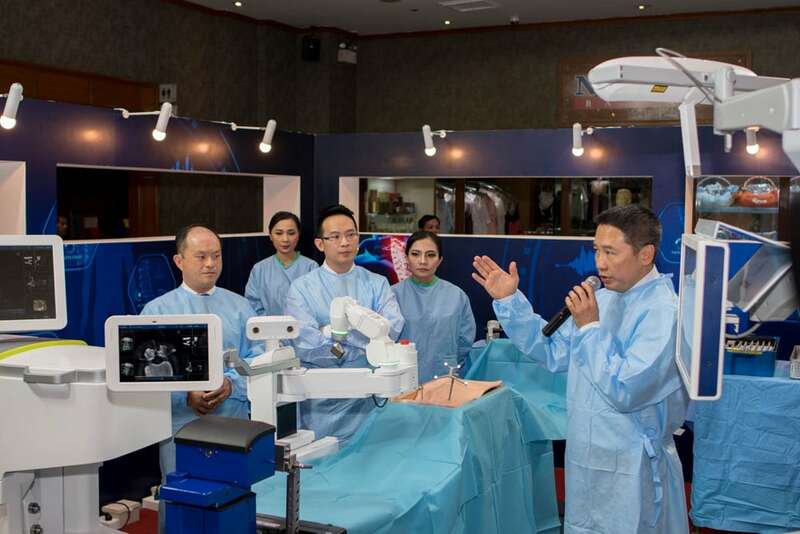 Prof. Thanet Wattanawong, is respected by surgeons in the Asia-Pacific region as a high-level training facility for endoscopic (keyhole) spine surgery.